Are there Any Craft Kits for Girls That are Popular? 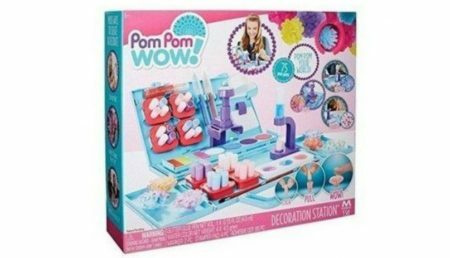 | Pom Pom Wow Decoration Station is My Pick – What Toys Are Popular? This post contains affiliate links. Please check the full disclosure policy for more information. Thanks. I’m one of those parents (and now grandparents) who loves to that help kids do something. And the Pom Pom Wow Decoration Stations is just ticket. It’s one of the most popular craft kits for girls on Amazon right now. And I can see the fun of it. Teeny, tiny pom poms that can be used to decorate everything in sight, from shoes to barrettes to pictures frames to… well, everything! It’s definately a toy that has plenty of replay value. That’s because it comes packed with plenty of different projects that your child can use to let his or her creative side shine. The box comes with everything tucked in so that you can keep all of your supplies neat when you’re done using them. The station can be opened and spread out so that a child has easy access to it or it can be propped on the piece that’s with the station and used just like an artist would use an easel. 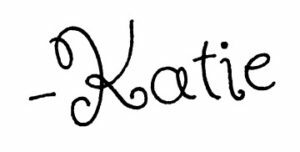 There are tons of different supplies and four basic ways that a child can create unique designs of her choosing. The station comes with the decorative station and includes 120 of the Pom Poms. You will have the option of ordering more of these. Since the station is a lot of fun for kids, you might want to think about going ahead and purchasing some extra Pom Pom refills. 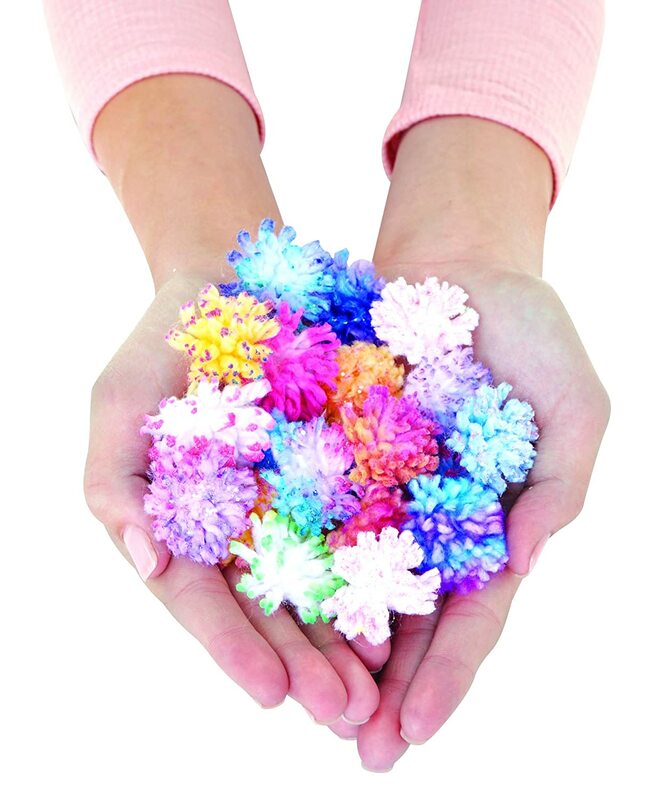 Included in the station are the 135 adhesive dots that kids will use with the Pom Poms. The Pom Poms are in the shape of pellets before they’re used. There are eight of the removable trays with the set along with a water tray. The station has an adhesive roll dispenser to make creating the designs easier. There are two markers with the purchase as well as a blotting cloth. The set also includes 1 paint brush and 1 pipette. Also included for kids to use to design with are 4 stamp pads, 4 water colors and 1 glitter get pen. All kids have to do to use the Pom Poms is decorate them with their chosen tool such as one of the stamp pads, then stick the Pom Poms on whatever surface they’re decorating. You will have to use the adhesive to get the Pom Pom to adhere. A slight finger tap on top of the Pom Pom opens the decoration up in a puff shape. The colors in the Pom Poms will be different styles and hues depending on which tool the child uses to color the Pom Poms. There will be a difference in the amount of time the project will have to dry – also depending on which tool is used to color the Pom Poms. The station comes with easy to follow directions along with illustrations. Clean up is a breeze with the toy and once a child is done with it, the station easily folds up. The supplies can be contained within the station. The suggested age range for using the station is between 8 and 11 years. 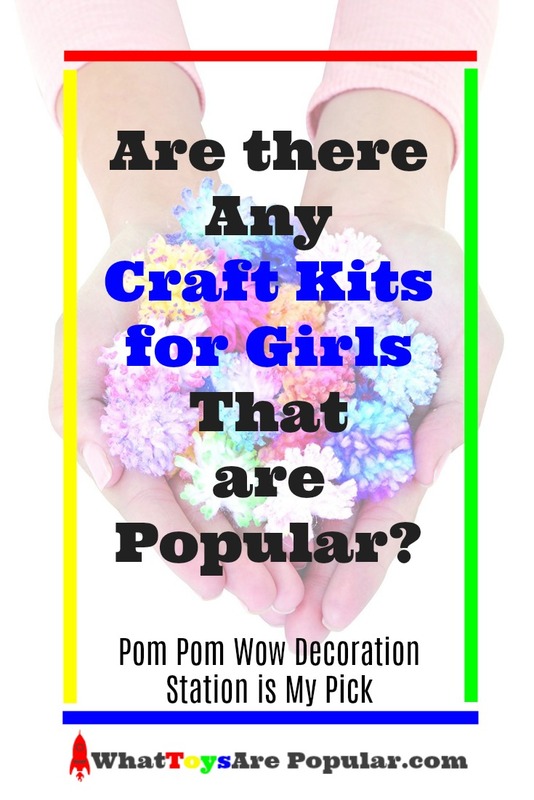 If you’re looking for a fun craft kits for girls, then the Pom Pom Wow Decoration Station is sure to please… and for not a lot of money, either. What Barbie Playsets will Girls Want This Year? | Barbie Rainbow Cove Castle Playset is Popular!